IMPORTANT: DO NOT ATTEMPT TO STOP THESE PROCESSES YOURSELF. If you must stop a process, see your system administrator. In the Vectorize/Render Queue window, select the job you want to stop and click Delete. Right-click on the Windows task bar and select Task Manager. The Task Manager dialog box appears. Vectorizing or rendering starts a process named AnimatePro.exe. Locate it and select it. 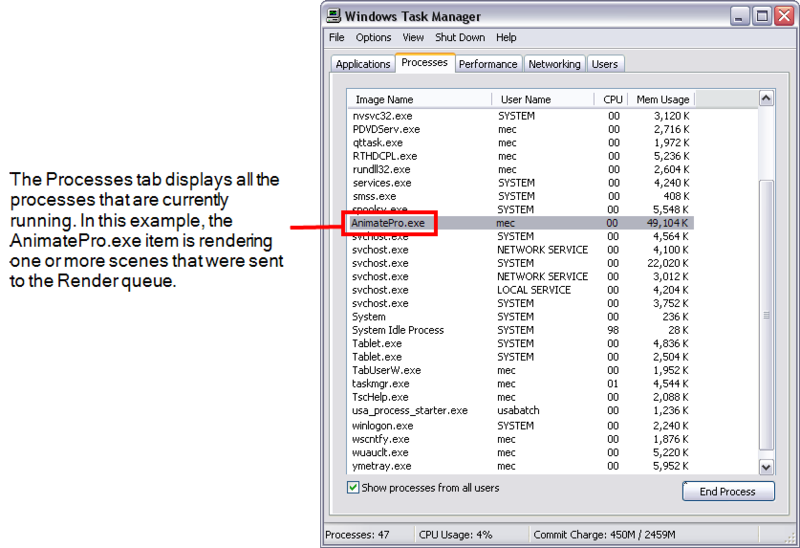 TheTask Manager stops the process and removes it from the Processes tab. NOTE: If you stop a process, but do not delete the job from the Vectorize or Render queue, the queue marks the entry as in error (Pending-E) and the entry stays in the queue. This is why it is important to remove the entry from the queue before you stop the process.